The function of proteins, which are the molecular tools of the cell, is governed by the interplay of their structure and dynamics. Advances in electron microscopy have now enabled scientists to capture structural information in amazing detail, but it is still difficult to monitor protein dynamics, especially over long periods of time. A team led by Professor Thorsten Hugel from the Institute of Physical Chemistry and the BIOSS Center for Biological Signaling Studies at the University of Freiburg and Professor Carsten Sönnichsen from Johannes Gutenberg University Mainz (JGU) have used a new method to record the dynamics of individual proteins in action over 24 hours. Comparable measurements were previously only possible for a few seconds. They describe their approach and results in an article in the journal Nano Letters. The researchers attached two gold nanoparticles to the protein of interest and observed the distance-dependent interaction of the gold spheres using laser beams. The stability of this molecular assembly makes it possible to create a video of the movement of the protein over a whole day. Thus, it extends the previously achievable measuring range of other single-molecule measurements by several orders of magnitude and enables researchers to ask new types of questions. In future, it might be possible to test whether individual molecules display memory or whether proteins with an identical chemical structure might behave differently over long periods of time. The biochemist and physicist Dr. Markus Götz worked in the Hugel laboratory at the University of Freiburg and is an expert on the heat shock protein Hsp90. Hsp90 is present in almost all cells in the human body and has important functions in many fundamental processes. For example, it plays a central role in the folding of linear amino acid chains into functional proteins with a precisely defined structure. "For the first time, we were able to observe the movements of Hsp90 over long periods of time. The significance of some newly discovered strikingly slow movements in Hsp90 is not yet fully understood," explained Hugel. Electrical engineer Weixiang Ye from the Sönnichsen lab at Mainz University developed a greatly improved measurement setup for this project. It was important, for example, to reduce the huge amount of data collected during the 24-hour recording so that the recordings could be played back on normal computers. 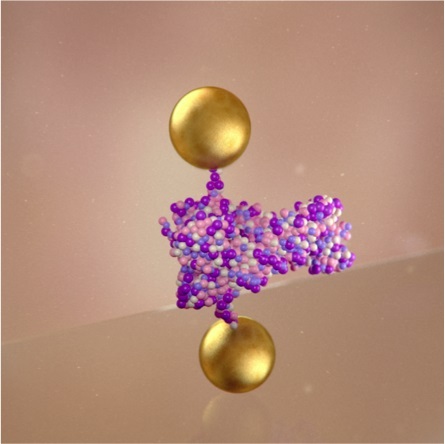 The biomedical chemists Sirin Celiksoy and Laura Tüting from JGU carried out the complex chemical tinkering that is required to specifically place a single protein between two tiny gold nanoparticles and ensure that the nanoparticles do not stick to one another. For this project, Hugel and Sönnichsen are both funded with a prestigious grant from the European Research Council (ERC). "The ERC funding has enabled us to develop this project from the ground up before we were able – almost 10 years later – to make and analyze these measurements," said Sönnichsen. "None of us would have managed such a complex project on his own. The decisive factor was that we combined our respective expertise in Mainz and Freiburg." Based on the current results, Hugel and Sönnichsen are certain: "We want to continue and expand our collaboration." 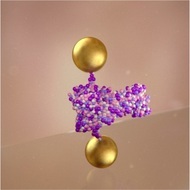 The depicted plasmon ruler consists of two gold nanospheres, which are connected by a single protein (here: Hsp90). This allows the researchers to follow the dynamics of Hsp90 for a full day at video rate.